Okay, so there’s a slight chance of rain today. Which makes what we’re about to tell you... less than immediately useful. But still, maybe you’re reading this poolside in Mexico or something. Anyway, you’re about to enter a world where you’ll never be sunburned again. And... well, that seemed important right about now. Meet nēvus, an iThings app that tells you exactly what to do, sunscreen-wise, based on who you are and where you are, available now. This is like a personal sunscreen butler... in your pants. You’ll use it at the beach, the pool, a sidewalk café, sailing or, you know, anywhere else with exposure to sunlight during non-fog hours. 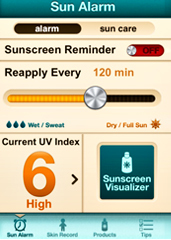 Next, you’ll consult the Sunscreen Visualizer to see the proper sunscreen amount of SPF to apply. If you’re sunning a part of your body that doesn’t usually get a lot of sun... go for more SPF.